Ken Norris, Executive Chef/Owner, Riffle "Smallwares. I love the scallop sashimi and oxtail curry. And you can't go wrong with fried kale and candied bacon and fish sauce. Absolutely addicting. Ben Edmunds, Brewmaster, Breakside Brewery "Hands down it has to be Ox. Every time I went, it turned out to be one of those meals where you just sit and shake your head in disbelief that all the food is so good. For an alternative that hasn't gotten as much hype, Cedo's makes awesome falafel. 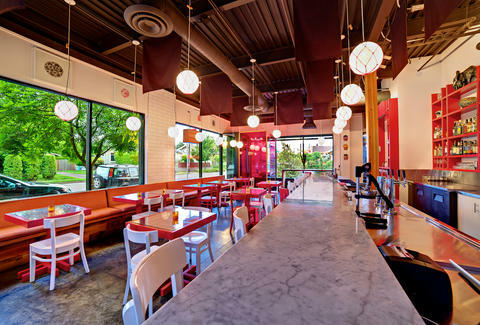 Forget Division: 2012 was the year of great restaurants along MLK. Cathy Whims, Executive Chef/Owner, Nostrana/Oven & Shaker "My favorite I would have to say is Xico. But also on my list would be Smallwares, Lardo, and Mi Mero Mole. Gabe Rucker, Executive Chef/Owner, Le Pigeon "Boxer Sushi. Greg Denton & Gabrielle Quiñónez, Executive Chefs/Owners, Ox "Smallwares. Or maybe we should specify Barwares, because that's where we tend to end up when we're in the mood for a late meal and a cocktail after work. We love Johanna Ware's cooking. She is clearly not afraid of big, bold flavors and unexpected combinations. Great hospitality too, no matter what time of day or night. Justin Woodward, Executive Chef, Castagna "I'm really digging Wurst right now. It's hard to argue with skee-ball, Big Buck HD, and whiskey. Brandon Wise, Bar Manager, Imperial/Portland Penny Diner "I'm a big fan of Roadrunner Cafe, a great little brunch spot in Southeast. Solid food every time, great value, and they just started offering a kickass Bloody Mary, which has led to a direct decline in the amount of cooking I do at home on weekends. Tommy Habetz, Chef/Co-owner, Bunk Sandwiches/Trigger "Lauretta Jeans. Gregory Gourdet, Executive Chef, Departure "It was Ox for me too. It got better every time I went. We live in a chef-driven restaurant town and you can’t beat Greg Denton's awesomely outlandish sense of humor and Gabi Quiñónez's gracious warmth. I live down the street from Ox, and loved eating bone-in grilled halibut and grilled radicchio and avocado salad at the bar on many a Sunday night. The menu is simple, flavorful, and has healthy options but is not cheap, so it makes it that much more special to go. Warm space, friendly staff, good food. Chris Angelus, Founder, Portland Food Adventures "Ox, Roe, Riffle, Smallwares, Bollywood Theater, but a place I really dug that I discovered and I can get into and afford to go to over and over and over -- and did -- is Robo Taco. I haven't had a two-buck taco there I didn't like, a lot, yet. Mike Thelin, Co-Founder, Feast Portland "Smallwares. Johanna Ware is one of the most inventive cooks in Portland, and has brought the city a host of new tricks. You can already see her influence on other menus around town."